Families and individuals in the middle and bottom ranges of the income ladder suffer widening inequality in a number of ways. As the ladder elongates, they're likely to feel relatively more deprived. They're more likely to marry or partner with others in the lower ranges of income, thereby compounding their relative disadvantages. Upward mobility is harder to achieve, because the same degree of effort gets them a shorter distance up the ladder. They're likely to experience more geographic segregation by income -- resulting in lower-quality public services, inadequate access to public transportation and jobs, and fewer models of successful upward mobility around them. 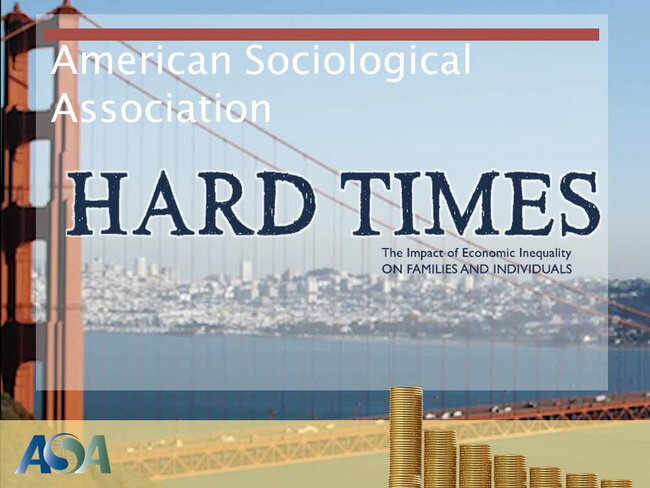 At the other end of the ladder, widening inequality tends to insulate wealthier individuals and families from the poverty and economic insecurity others in society are experiencing. To an ever larger extent, being "rich" means not having to come across anyone who is not. The advantages of wealth are compounded through marriage, and investment in children. Wealthy tend to know that they and their children and grandchildren will do fine. As a result, they are incapable of doing the Rawlsian experiment; they cannot imagine what the rules of society should be under a "veil of ignorance" about where they'd end up in the pecking order. The result is the breakdown of a society -- to the extent that by "society" we mean a system in which members feel some duties to one another. little bit of an ethnographic inquiry into -- well, it was both the combination of observation and interviews with regard to the sociology of sociologists in their social setting, being socialable. himself a moral philosopher because the central inquiry was then, as I think it should be now once again, what is a good society? What do we mean by a good society? How do we achieve a good society? distributional issues. And once you begin looking at distributional issues, it is almost impossible not to at least tacitly begin looking at issues of distributional justice. using the right deflator? Even Thomas Piketty's work has been picked over. we didn't get terribly excited or upset about widening inequality. Coping mechanism number two was everybody working longer hours. are being utilized in a variety of ways to convince most people that the economy notwithstanding widening inequality is nonetheless appropriate and just. important, then maybe they wouldn't create jobs if they're the job creators. And so there is a frame on this mythology that is not only economic but it is also sociological. the conversation in a way that generates that kind of social understanding. worth somebody's work is to a society. But it's hard to imagine that David A. Cohen -- and I don't mean to impugn him, but $2.3 billion for a hedge fund? have enough education. A different frame that makes it harder to talk about what's happening distributionally in the economy. truth to this. But it is less and less the case. broadly based opportunity because we prefer to have that as our self-image. But again, like the other two myths, it gets in the way of discussing reality. dollars in good schools for poor people and poor communities. the structure of the economy that is generating wider and wider inequality and greater and greater stress in the middle. But that mythology is blocking a lot of constructive discussion. degree of polarization and gridlock we have, we might be able to get on and do something about widening inequality. A variety of policies. nastiness that we are experiencing right now. I think a lot of it comes out of the fear of being downwardly mobile. believe inevitably we will do it again. There is a kind of homeostasis in the American political economy. Eric Cantor was defeated by David Brat, a Tea Partier. But his platform and his criticism of Eric Cantor was that Eric Cantor was in the pockets of Wall Street and big business and crony capitalism. similar sentiments from a fellow who you would not expect it from, let alone PIMCO, the CEO, Lloyd Blankfein the CEO of Goldman Sachs, said almost exactly the same thing. Why are they saying it? to consume. The bottom 90%, if they don't have enough money, they're not going to consume, the economy is not going to grow, we are back to exactly what Standard & Poor's said. the importance of moving to a more shared prosperity. They also -- I believe find the five dominant mythologies less persuasive than they have been. you want in terms of optimism? do believe that over the next few years American politics is going to be tricky. I have a confession to make right now I've not made in public. I would appreciate it if you kept it in this room. hands in the air. And I'll call on you. We'll keep this very informal. We'll just do a little bit. I know many of you are tired. You've traveled a long way. Yes. Oh, there's a microphone. >> There are two microphones. Oh, there are two microphones. Okay. We'll get a little bit organized and why don't you come to the microphones and stand in front of the two microphones. And yes. you feel that globalization will complicate the picture in terms of the corrective or the ability to correct inequality? are doing a better job. Globalization is certainly an issue. It is -- but I think we can still do a far better job than we are doing. reason for some of this discord. turned around very, very dramatically. So, again, I don't want to overdo the parallels, but I do believe that they are worth looking at very, very carefully. who many of you probably are very supportive of. And let me just ask you, Ted Cruz. [Laughter] Well, there it goes. you have a Republican Chairman of the House Ways and Means Committee doing all this? The times are changing. It's very interesting. We need to talk about this. Yes. implications of climate change and those issues that may not contribute to your optimism. >> I'll make it quick. deduction, but what else would you do to fix it? Would you phase out the mortgage interest deduction? Studies have shown that it does not increase home ownership and it is fundamentally regressive. What else could you see us doing with the tax code? >> If you want policies, I would take a look at all of the tax expenditures; that is, all of the major deductions and tax credits, particularly the ones that are regressive. Mortgage interest is one. the mansions they already have. That's a source of potentially a lot of money. I think it will be a lot of action in that arena in the future.